The Republic Of India attained its independence and freedom from the British rule on 15th August 1947. India unfurled its flag of freedom on this day and since then the date of 15th August holds a special place in every India’s heart. A national holiday, this day is celebrated with much fervor in every nook and corner of the country. People sing songs, narrate freedom stories and relish the freedom attained from the 200-year-old British dynasty. For India, 15th August is regarded as its re-birth or a fresh start. 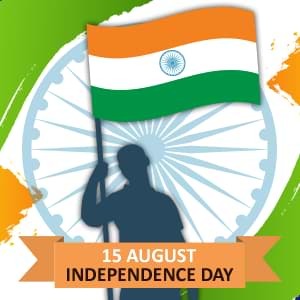 The British Government handed the nation its final independence on 15th August 1947 to the Indian leaders putting an end to the struggle and fight that lasted for decades. On the historic date, 15th August 1947, the flag was hoisted on the Red Fort by India's first Prime Minister Pandit Jawaharlal Nehru. In the year 1858, there was a complete control of British Crown over India. There were exploitative and repressive laws passed by the British after the World War I. It resulted in revolutionary calls for country’s independence carried on with the movements of non-cooperation and non-violence followed by nationwide civil disobedience. The revolutionary and enduring leader who was regarded as a national symbol for the radical movements was Mohandas Karamchand Gandhi, recognized as, The Father of the Nation. The upcoming decades were stricken with continuous struggles between the British and the Indians for freedom. The people of India, the freedom fighters and the Indian National Congress carried out several acts and movements. In June 1947, the partition of India took place. Millions of individuals who belong to diverse religious groups were tramped across the border for finding a place for themselves to reside. After a massive violence and the partition, finally on the day of 15th August 1947, the Independence of India was announced by Pandit Jawaharlal Nehru by reading the well-known speech Tryst with destiny. How Is Independence Day Celebrated? Independence Day is proudly celebrated by the Indians every year. The day is regarded as the country’s national holiday. Though, all the local governments perform the flag hoisting ceremony across India. The main celebration takes place at Red Fort in New Delhi. The celebrations initiate when the Prime Minister of the country unfolds the tricolored national flag. The Indian PM then addresses the nation with an inspiring speech which details on the current condition of the country, various achievements made in the previous year as well as the future growth plans. he Prime Minister also pays a tribute to all the freedom fighters of the country. The flag-hoisting ceremony and various patriotic programs performed by the children are the key attractions of this day. In the Central and the Northern India, kite flying is one of such event which is held on Independence Day. People display their feeling of patriotism for the country by decorating their homes, vehicles, clothes and workplaces with beautiful tri-colored Indian National Flag. In various parts of the country as well as the world, the day is celebrated with parades and ceremonies. In some of the states of the United States, 15th August has been declared as India Day. Almost in all the government organisations, universities, colleges and schools, the national flag is hoisted with utmost pride and honour. Nowadays, a number of societies, clubs or housing complexes, etc. even perform the flag-hoisting ceremony in their specific premises and celebrate this day by exchanging greetings and wishes. All such celebrations reflect the togetherness and the unity amongst Indians, who never forget to thank and pay tribute to the sacrifices of the people who lay down their lives fighting for the independence of their motherland. India is a land of many such cultural and national festivals, and each festival is celebrated with loads of enthusiasm and spirit. 15th August is one such day which brings the entire country together to remember the times of trial in pre-independence era and to remind us of the value of the freedom we enjoy today.